With four locations in the South Central Ontario Area, Turtle Bins, the affordable plastic moving bins renter, opened its doors to the community and celebrated its inauguration with an unlimited time 10% Price Match Guarantee offer. Eco-friendliness and convenience are two features plastic moving boxes offer by default; however, we differentiate ourselves by offering the best possible price. Turtle Bins, the affordable plastic moving bins renter, started engines last week in South Central Ontario with their grand opening of three depots and one corporate location. Turtle Bins also sports a brand new website where they are offering a 10% Price Match Guarantee as an inaugural but unlimited time offer. Turtle Bins is a company that specializes in providing an affordable and much more convenient alternative to cardboard boxes for your move. Their plastic moving bins are sturdy, light, water resistant and leave a much smaller carbon footprint on our environment by being able to be used up to 400 times before being 100% recyclable. Plus, Turtle Bins offers the lowest price in the region. Joe Crupi, CEO of Turtle Bins, comments on his business strategy: "Eco-friendliness and convenience are two features that plastic moving boxes offer by default; however, we differentiate ourselves by offering the best possible price. We do this by having our processes and logistics optimized to reduce our costs as much as possible. Moving is already a heavy expenditure in anyone's budget, we want to lessen that burden as much as possible." Another competing feature against cardboard is that Turtle Bins get delivered to your door step and get picked up after being used. "A big hassle during a move is finding cardboard boxes and then breaking them down and getting rid of them after unpacking. We've invested in our logistics plan so our boxes can get delivered and picked up without this having a big impact on our costs. This allows families to spend their time settling in their new place, not folding boxes," said Crupi. Turtle Bins extends its commitment to the environment by contributing financially to several organizations fighting to save sea turtles from extinction. Turtle bins provides plastic moving boxes for rent with attached flip-lids and dollies in several locations around Ontario. The company has locations in Newmarket, Barrie, Nobelton and Markham and delivers anywhere within a 50 km radius. You can pick them up or get them delivered. Turtle Bins are sturdy, light, and stackable enough to protect your belongings from being crushed or getting wet. They also have a much smaller carbon footprint on the environment by being able to be used up to 400 times before being 100% recyclable. Conveniently, they are the cheapest moving bins you'll find in South Central Ontario. 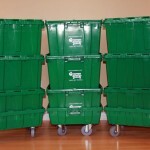 Moving with Turtle Bins is the convenient and affordable way to move.